there are still openings in the falkland fiber club if you’re interested! brainless and fun. raveled here. i’m not making many decisions on this one, just enjoying the process. i might have enough of the purple to work the whole blanket, but i might not want to. i’ve been pondering different tweeds or some handspun squares… i am, however, going to use up as much of the white as possible. love! tweed! he’s graduating! and she’s been great. and it’s my first time knitting with kidsilk haze, which is simply a gorgeous yarn. although a bit thin for my taste, it is perfect for this project, and so i am sucking it up and enjoying the beauty while it lasts. raveled here. of course, that’s not all that’s on the needles, but that’s the new stuff. i’m also planning to cast on for the crossbow mittens to match the hat. mostly i’m waiting in a limbo… handmade arcade is coming up and i need to wait until after it to steal more of my hand dyed yarn and work on some more designs. p.s. a bit late in telling you here, but here’s this month’s newsletter if you’re interested. 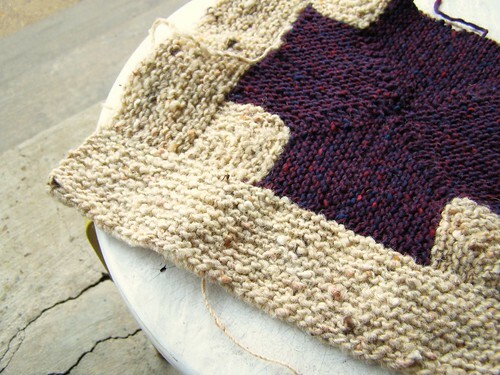 This entry was posted in blanket, cosyknitsliterally, knitting, scarves by cosymakes. Bookmark the permalink. oooh that scarf is just beautiful love it. 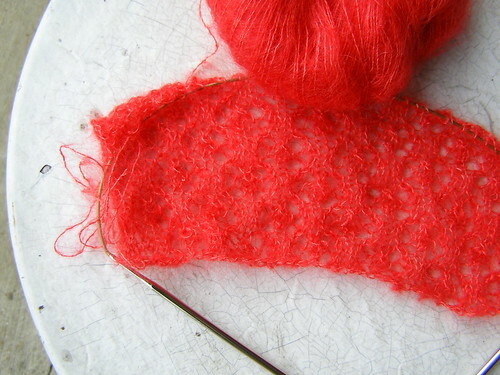 That kidsilk shows the stitches so well. Sigh– dreamy… it’s nice sometimes to go outside our ‘comfort’ yarns hey? im so excited to see you at handmade arcade! i might not be able to talk from my tonsillectomy, but darnit, i will be there. I have heard such great stuff about you from everyone at natural stitches.